San Francisco billionaire Tom Steyer apparently didn’t take any time off for Thanksgiving. They won’t take office until next year, but newly elected Democrat members are already feeling pressure from Steyer to impeach President Trump. Last week, Steyer released a new television ad featuring himself proclaiming to the camera that President Trump is “unhinged” and that Democrats need to “hold him in check” through impeachment. As Steyer delivers his lecture, the images of freshman Democrats like Alexandria Ocasio-Cortez flash across the screen – a clear sign that Steyer is calling out these new members, many of whom he financially supported during the election. It begs the question – why is Tom Steyer attacking his allies, especially as Ocasio-Cortez ramps up her conflict with the Democrat establishment to demand a “green” new deal and immediate action on climate change? Shouldn’t Steyer, the self-proclaimed environmental activist, support his allies that now control a house of Congress, and not distract with TV ads pressuring them to impeach the President? Why is Steyer not using his cash to promote Alexandria Ocasio-Cotez’s environmental agenda? Because Steyer is juggling his environmental activism with promoting his likely presidential campaign. 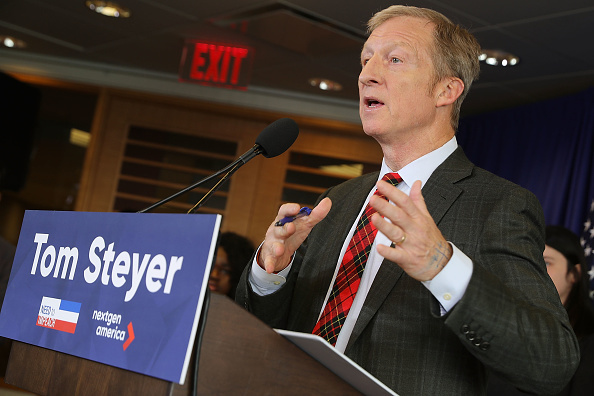 As Steyer ramps up his likely 2020 bid, it seems that talking about impeachment and getting his face on television screens is more important than supporting his environmental activist allies. Tom Steyer, can’t work with him – can’t get elected without him.